Note: As I thought of writing something like this, it sounded fairly simple. A one-stop guide for everything related to survival (survival mode, SMP) in Minecraft. But as I progressed through the making of this article, I realized just how much there is to cover. It was quite a challenge, especially since I decided to make videos for a lot of these tips. The result is a guide that covers basically all aspects of this topic. As such, I might not have covered everything there is to cover, and I gladly welcome any changes/inclusions that anyone might have. So read on and enjoy! 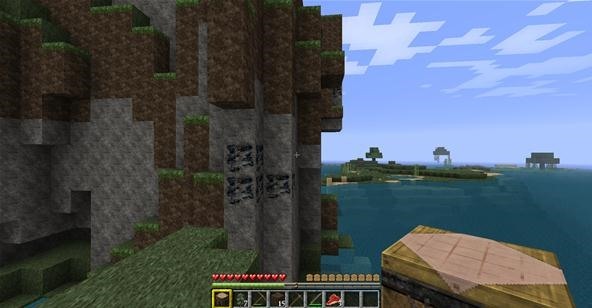 Survival mode has long been the staple game mode for a lot of Minecrafters, including myself, who frequently pleasure themselves with the simple act of survival in the wild. It is a dangerous world out there, and without proper understanding of its dangers and rewards, one cannot survive. The goal of these articles is to cover everything humanely possible to help aspiring and professional survivalists learn and hone their skills. Topics are arranged by order of simplicity and are made easy and simple to read from beginning to end, or to the topic of your choice. 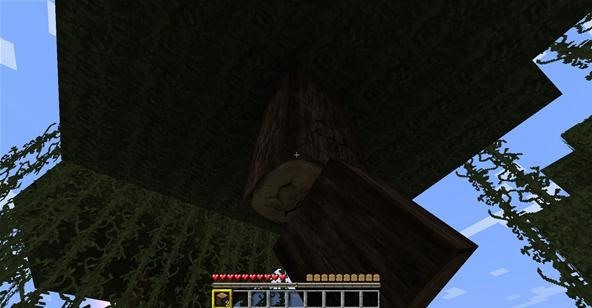 The first thing that should come to your mind when you spawn in a world, whether it be Singleplayer or Multi-player, should be "WOOD!". Train yourself to think about wood the moment you spawn. It's the most important resource of all (in my opinion). If you spawn in a desert, look around, and walk around in all directions; maintain a reasonable perimeter. Then, decide which direction is the most promising and keep walking there. Water is a great sign. Follow it! Collect at least 16 raw wood, which will give you a stack (64) of fine wood. The next important thing to do is make a pickaxe, which requires a crafting table. 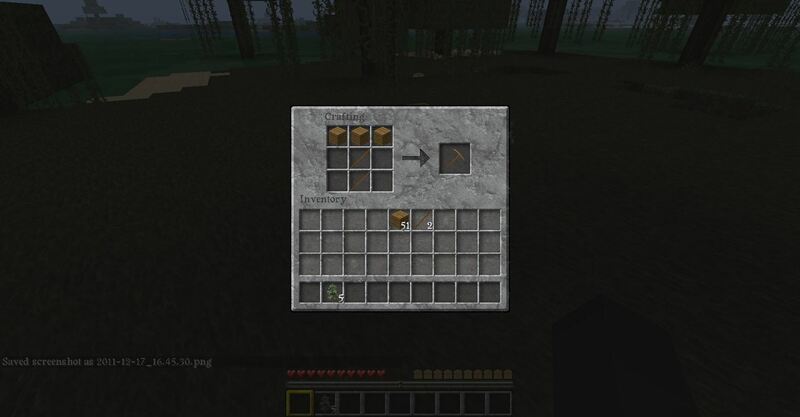 (1) Crafting Table, (2) Sticks, (3) Pickaxe!, (4) Upgrade!, (5) Aha!, (6) I didn't mean to do it! Now, we hunt for stone, an important aspect of starting off. Using the wooden pickaxe, mine at least 10 cobblestone blocks. 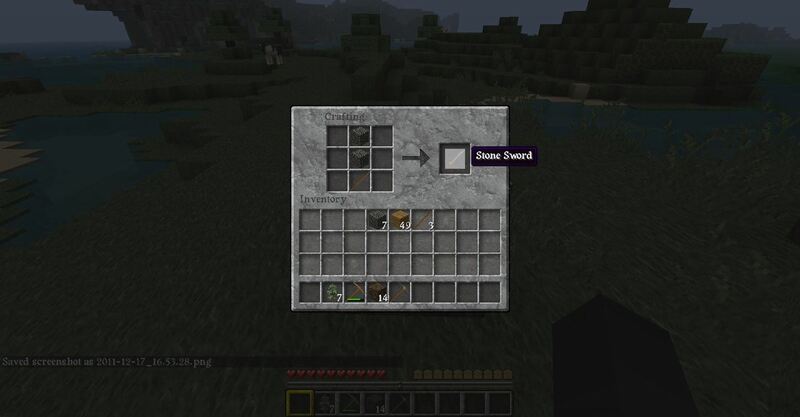 Then use the cobble to make a stone pickaxe and a stone sword. When that's done, find some food. Take ALL the food you can find. The steps are shown in the gallery above. The last part of a successful and promising start is to find coal and shelter. While it isn't paramount to starting off (you can spend your first few nights without it), it will soon be the most important resource that helps you with everything from cooking food to smelting iron. Find enough coal to help you survive the night; since it's your first, gather as much as you see. I usually dig a small opening where I find the coal, and if it gets dark, that becomes my shelter for the night. 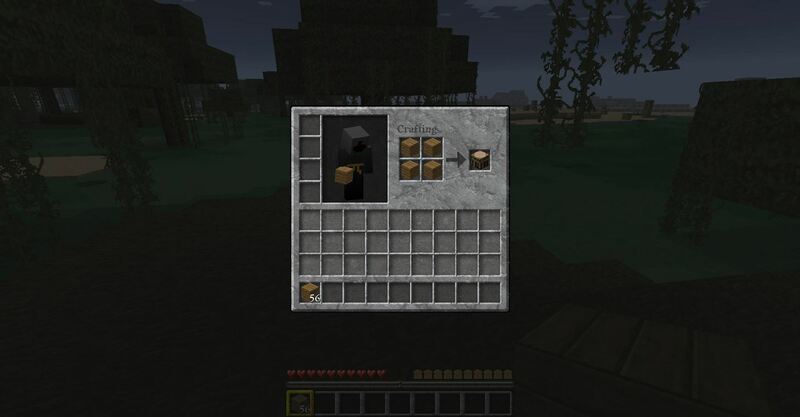 If you want, you can now make a furnace with your cobble to cook the food you have. As soon as you spawn, hunt for wood. Collect at-least 16 blocks. Make a crafting table, wooden pickaxe and if needed, a sword. Search for coal and stone. Mine as much as you think you need (you usually need more than you think!). If it's dark by this time, use the hole that was mined for the coal or cobble as your shelter. Expand it as needed. If it isn't dark, continue to collect food, coal and cobble. Make a furnace to cook your food. 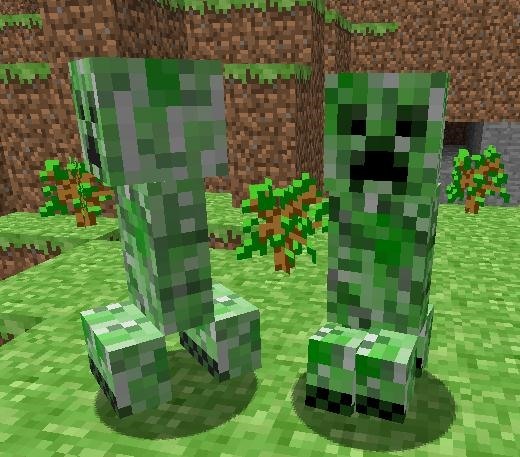 Creeper—An infamous, green-camouflaged, near-silent exploding mob that will chase players and hiss before blowing up. What makes them dangerous is that not only can they harm you, but also the environment. Creepers hiss for about 1.5 seconds before exploding. Will not burn in sunlight. 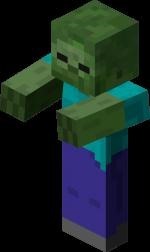 Zombie—A hostile mob with green skin and clothes that closely resembles the player. It is the most common mob that you will see at night. They are also the easiest to kill. Will burn in sunlight. Skeleton—A skeleton is a fairly fast-paced enemy that will shoot arrows at the player and any mobs that attack it. They are one of the hardest to kill without incurring damage. Will burn in sunlight. Spider—A mob that is neutral in sufficient light levels and hostile towards the player at night and in dark, shadowy areas. They are able to see the player through solid blocks. Will not burn in sunlight. Cave Spider—A hostile mob re-textured from the spider with a blue skin. More dangerous than the regular spider, but in turn they are much more rare than regular spiders. Cave Spiders do not spawn naturally, they only come from Spawners found in Abandoned Mine Shafts. Blaze—(a.k.a. 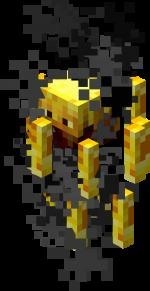 Nether Guard, Guardian), a type of mob found in The Nether. In their searching state they are confined to the ground and do not blow smoke. They will not start flying unless they spot the player. When pursuing, they catch fire for a short while before making their attack in the form of a three round burst of fireballs. After the attack ,they have a short cool down and then they will catch fire and attack again. Ghast—Very large jellyfish-like mobs that float through the air and shoot fireballs from their mouths. Found only in the nether. 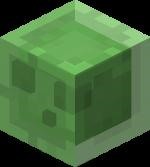 Slime—Animate, green, yet relatively rare mob in the shape of an ordinary cube that can appear in various sizes. They will follow and attack a player who comes close enough. When killed, a slime will split into smaller slimes, except for the smallest slime which will drop slimeballs instead. Slimes are found only in the lowest 40 layers of the map, and only in certain areas. 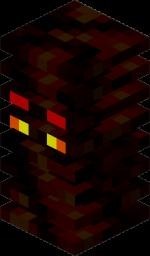 Magma Cubes—Hostile mobs found around The Nether. When killed, they release 2-4 smaller versions of themselves in addition to Experience Orbs, similar to Slimes. When they move, they jump up and momentarily unravel into several layers, giving them the appearance of a spring and revealing a molten lava core inside. They are slowed by and sink in lava, but do not drown in it. 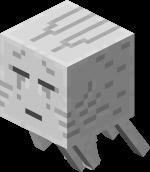 Silverfish—Small, bug-like monsters that hide in special blocks found in strongholds. These blocks will look identical to stone bricks, cobblestone, or regular stone, but take slightly longer to mine. When the block is mined, the silverfish pops out and attacks. This concludes Part One. Look out for Part Two, which will contain Combat! Have I missed anything? (Endermen will be added soon!). Do you want me to add anything? Post a response below and I'll consider it! What texture pack you using? The one shown here is the LB Photorealism Texture pack (256x256). Make sure you have a good system to handle it. you forgot a lot of mobs... Enderdragon, jockey spider, enderman, well you're going to add that one.